In the next three weeks, we will be exploring Blessed John Henry Newman’s masterpiece, The Dream of Gerontius. The poem in its entirety has been read and put into context previously on this site. The new reflections will be an expansion of these posts, not for the purpose of explicating the poem line by line but, instead, to give a deeper glimpse into a few points of this fascinating work of Newman who, at the end of his long and holy life, was thinking of and preparing for death. Because the “four last things” should be something all Christians contemplate, this magnificent poem of Newman may be studied and revisited throughout all stages of one’s spiritual growth. The poem, divided into seven parts, follows an everyman character – (the word “Gerontius” come from the Greek for “old man”) – and relates the emotions and prayers of this dying man, with corresponding angelic responses. The work, written after Newman’s conversion from Anglicanism to Roman Catholicism, explores his mature Catholic beliefs. Newman uses the death and judgment of Gerontius as a means to entice the reader into the contemplation of death and the necessary feeling of fear and unworthiness before God. “In effect, this poem is a sort of compendium of his [Newman’s] insights into the teaching of the Catholic Faith on life after death. It is also the expression of his personal experience of illness and his perception of the death of many loved ones” (Velez). Gerontius, afraid, calls on the Lord for help, even as he peers into the “blank abyss” which seems a “horror.” He is so afraid that he begs again for his friends to pray for him. In addition to the friends, he asks for the saints’ prayers as well. “The saints inspire and intercede for men and women who, without danger of idolatry, invoke their assistance. Gerontius’ friends, the souls in purgatory and the angels, all constitute the Church as a communion of faith and charity. For the author, now a Roman Catholic, the communion of saints is a natural and undisputed part of Christian life: the individual is alone before God and at the same he is accompanied by the community of the Church” (Velez). After many more intercessory prayers, Gerontius continues to describe, in chilling words, his vision and fear, in dreamlike regularly metered verse. Gerontius finally commends himself to the Lord. It is now time for the priest who comes to the door in silence with the Viaticum. He is led into the room and all genuflect or kneel in the presence of the sacrament. The priest then intones the “Proficiscere”, which is the first prayer in the Roman ritual for the dying and is a prayer of commendation for the departing soul. The earliest written text of this powerful prayer is included in two eighth-century sacramentaries.The priest, through the Proficiscere, bids Gerontius to go forth to the inexpressible joys that await him. Hath been pour’d out on thee! Could there be a better way for a Christian to begin the journey to meet Christ? We must pray for the gift of a holy death and final perseverance in the battles against the devil. 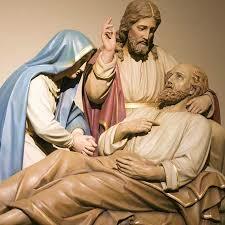 As Catholics we must renew the good practice of invoking the angels and saints – especially St. Joseph, who is considered the patron for a holy death – asking for the grace to die after receiving the sacraments. As Newman preached: “What we see is but the outward shell of an eternal kingdom.” The visible world is the veil of the invisible. Blessed John Henry Newman, pray for us!